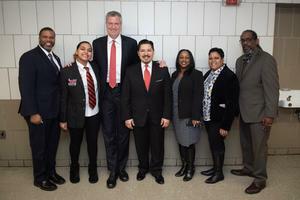 On Wednesday, January 23 2019, Mayor Bill de Blasio hosted a parent leader forum with the community, officials and Chancellor Richard Carranza. Boys and Girls High School, the oldest public high school in Brooklyn, is a comprehensive high school in Bedford–Stuyvesant, Brooklyn, New York. Paying tribute to Boys and Girls HS alumni Dwayne "Pearl" Washington for his contributions to the sport and the school. This video was created by students at Boys & Girls High School with guidance from BRIC Teaching Artists as part of the Art as a Catalyst for Change initiative. We would like to welcome you to fill out this quick survey. It will help us greatly! Complete the school survey online at www.nycschoolsurvey.org to help us hear your voice. It's available in 10 languages!